Can you believe it is almost 2016 already? I sure can’t! It has been a whirlwind year but a great design year for sure. I have been enjoying the ever changing trends and new innovations in design this year has brought as well! We have been seeing it all from rustic kitchens to contemporary baths, reclaimed wood barn doors to state-of-the-art under cabinet lighting systems with Bluetooth speakers! This year has given us the best of both worlds when it comes to design and I want to share my favorite trends, innovations and other design features this year has brought us! You may see the word “rustic” in interior design and think “what does that even mean?” Rustic details have really become popular this year from your kitchen to your bedroom! 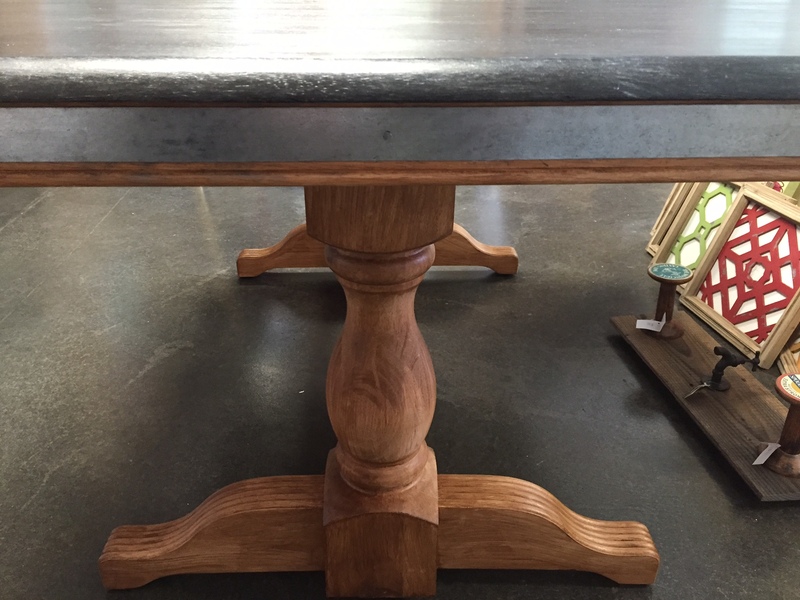 There are so many things that we offer here at DKM that can bring this trend into your home such as butcher block wood countertops, distressed cornice boards, industrial lighting and pallet wood walls and furniture! I like to call DKM the client’s “one stop shop” for all design needs because we pretty much have it all! 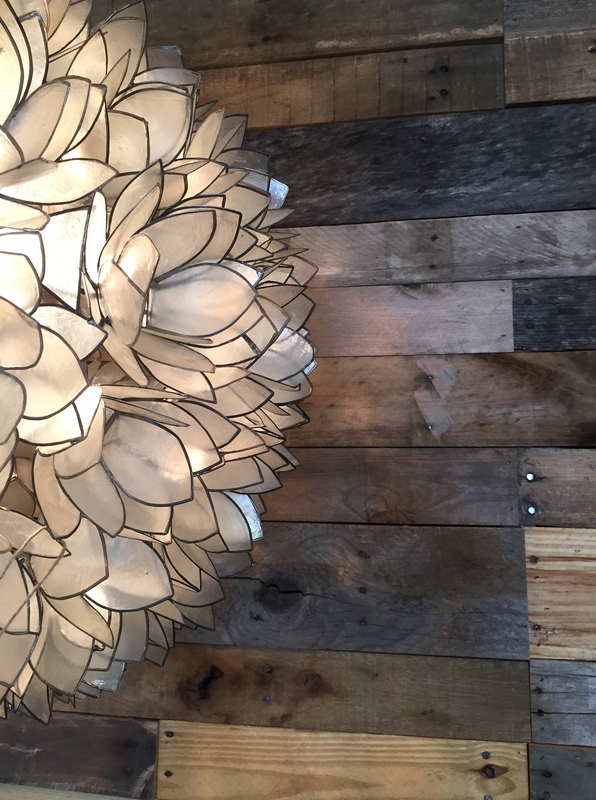 Take a look at some of the things we offer here that can transform any room into the rustic space you’ve dreamed of! 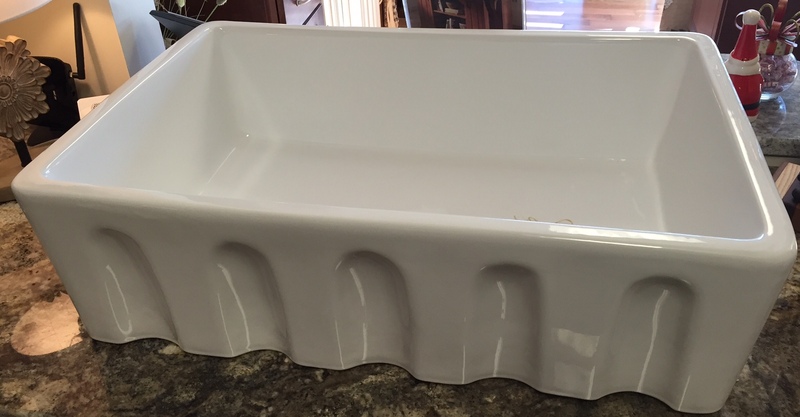 We have some amazing farm sink options! 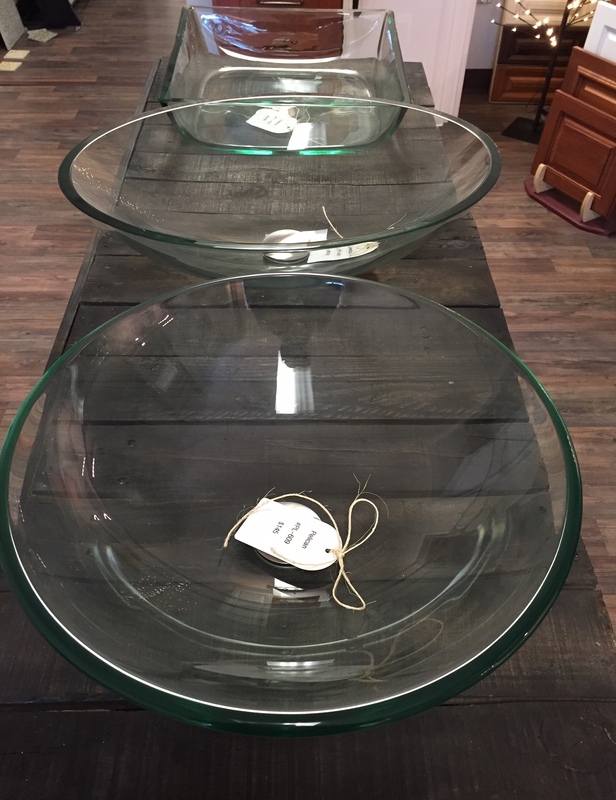 Single and double bowls! 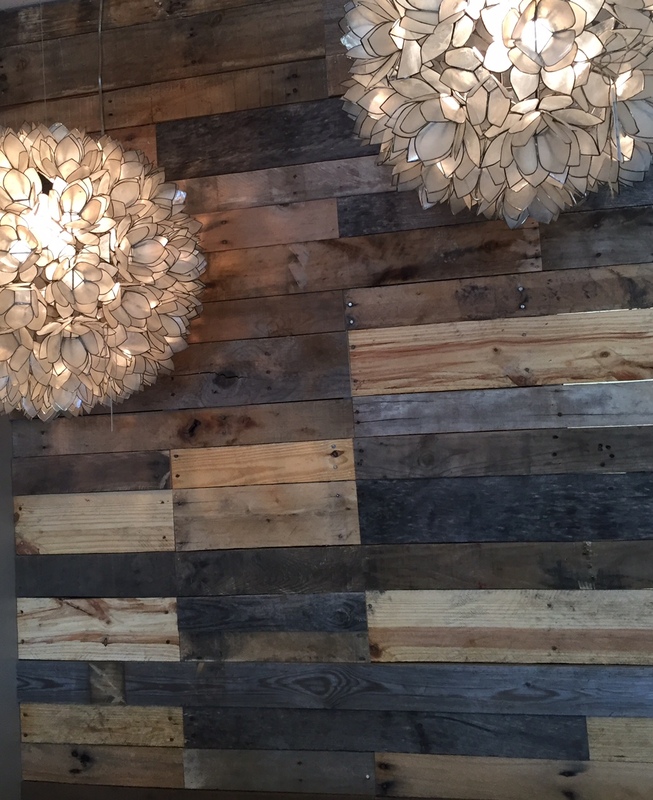 We have a subcontractor who can make you whatever you desire out of pallet wood! 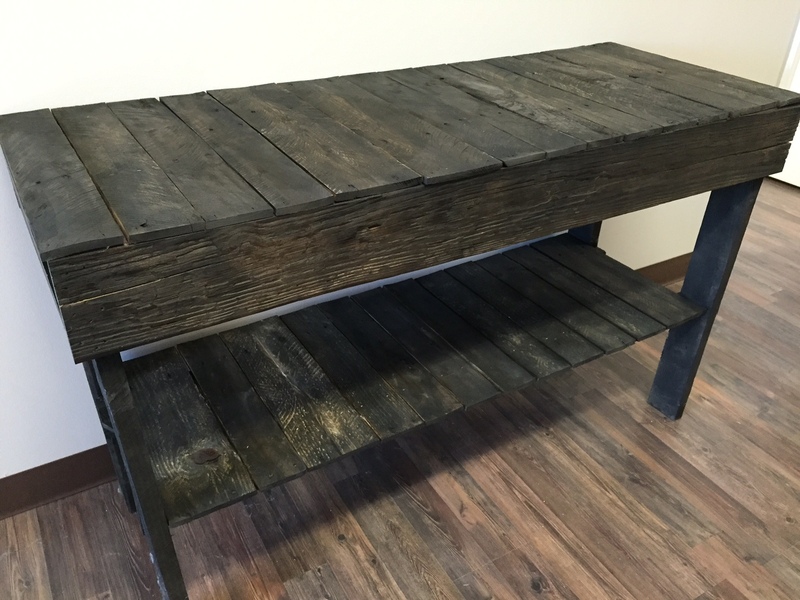 He can stain it like this table here, or he can leave it natural like our pallet wall below! Check out these capiz shell lotus pendants! They really offset the true rustic feel and bring in the glam! 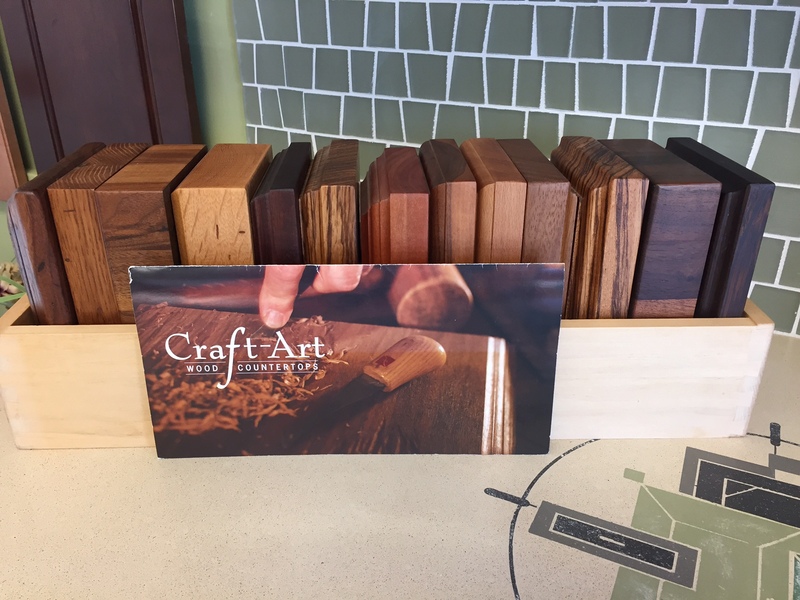 We carry Craft Art butcher block countertops! My favorite species are below! 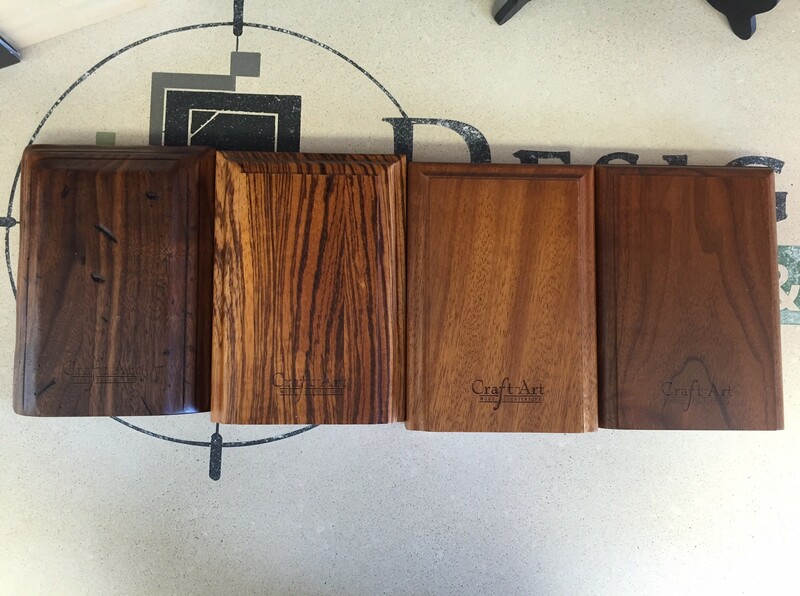 Distressed black walnut, zebrawood, chestnut, and iroko! We can also customize farm house tables for you like this one with metal strapping along the sides! We also offer a variety of other decorative accessories that can really turn your space into something rustic. My special tip: Add in some shimmer for a beautiful contrast! Where there is a ton of people who love rustic touches there are just as many people asking for contemporary designs as well! We are really seeing this trend take off in bathrooms. One of my favorite projects from this year is a bathroom that really brings in the contemporary and transitional touches. 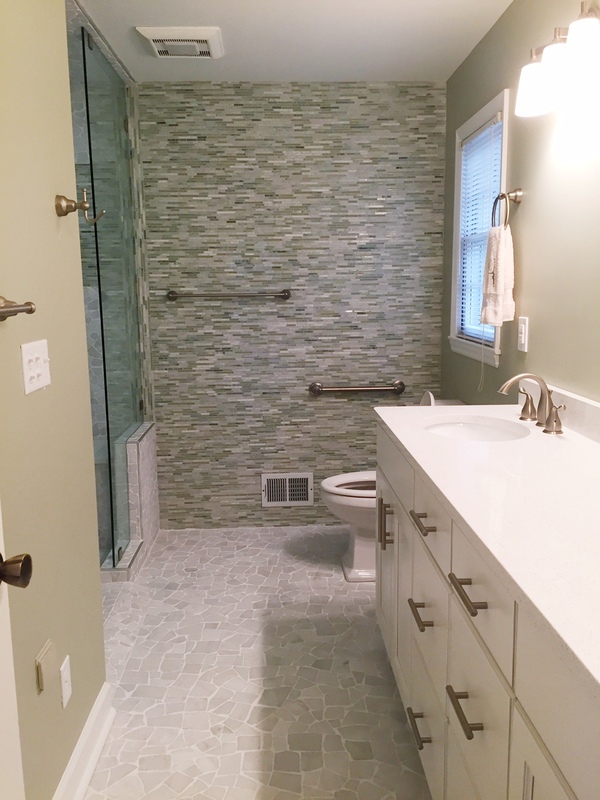 They wanted their bathroom to really stand out so we did an entire wall covered in tile at the end of the room so it gives it a true elegance. 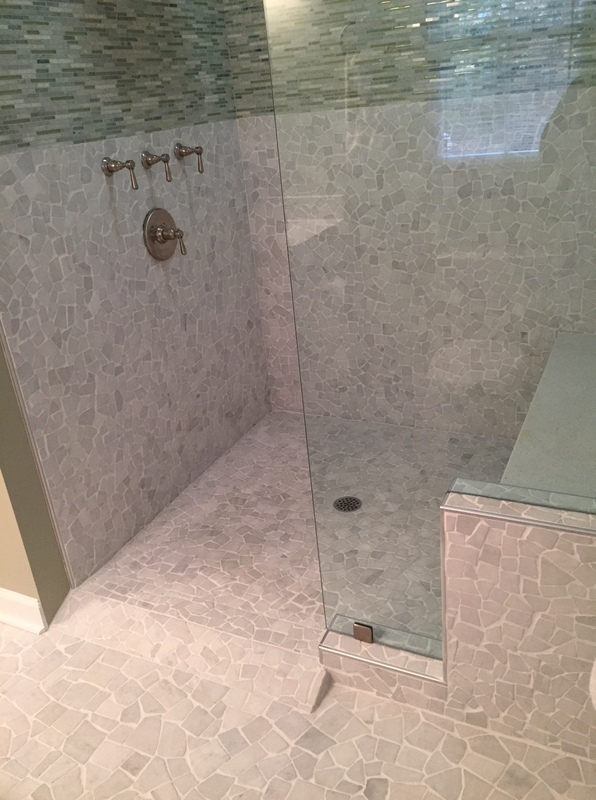 They wanted a curbless shower and no door as well! Do you want to know a secret? These clients are in their 60’s and retired! Contemporary and transitional designs aren’t just for the younger crowd. Anyone will love the clean lines and functionality of this kind of design. Take a look at the space below! This bathroom carries the wall tile into the shower as an accent band which I love! Tile walls are a clean way of bringing some serious interest into a bathroom. I also love that the floor tile carries into the shower floor, the broken quartz tile is truly beautiful! Since these clients are a little older, they wanted a grab bar next to the toilet for extra security. It still looks great! There are some other ways to bring a contemporary feel to your bathroom as well! From the sink you choose, the faucet, and even the tile. 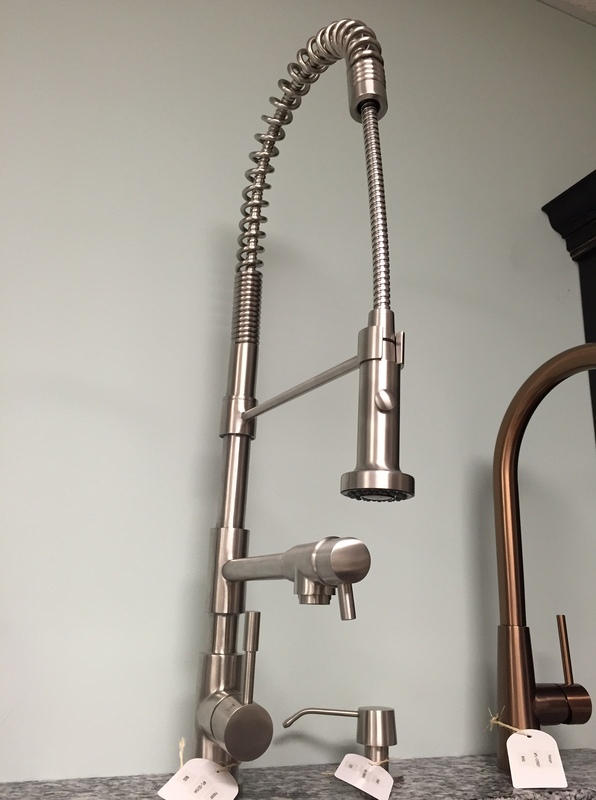 Check out below to see some new things we have in our showroom that you can use to bring that feel into your space! 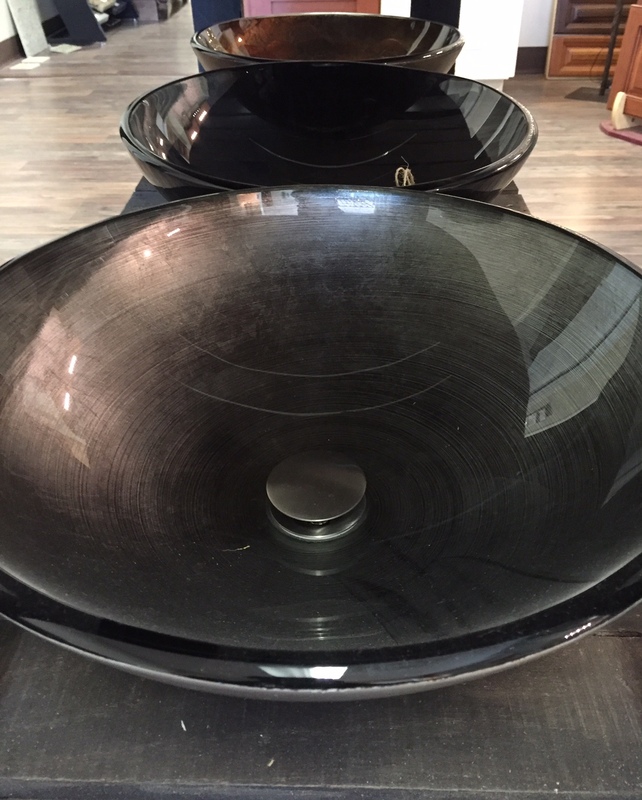 Ceramic vessel sinks are a fun way to bring some contemporary design to a powder bath or even your master if you are feeling bold! They come in a variety of shapes and sizes! colored glass vessels as well! Again there are so many shapes, sizes, and colors with these sinks! 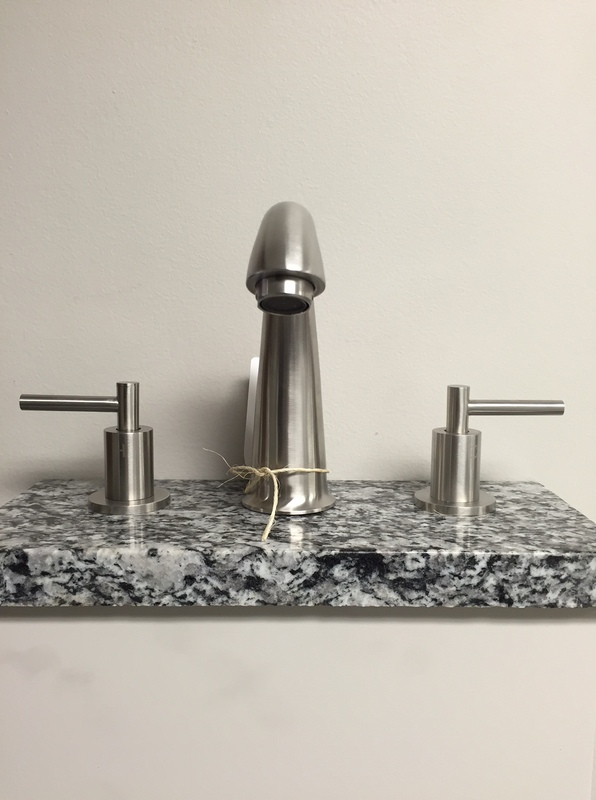 You can also incorporate beautiful, sleek faucets with your vessel sinks such as the one above. It is a showroom favorite! 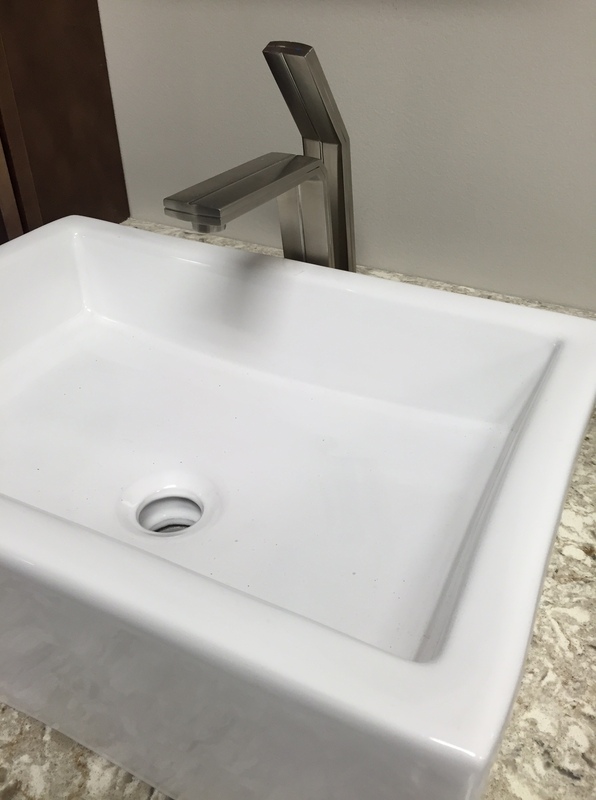 If you aren’t into the vessel sinks and want to stick with an undermount sink, you can still bring in that contemporary feel with your faucet like this one! Its simplistic handle design is amazing! Here at DKM we have a variety of tiles to choose from for a standout shower or accent wall! 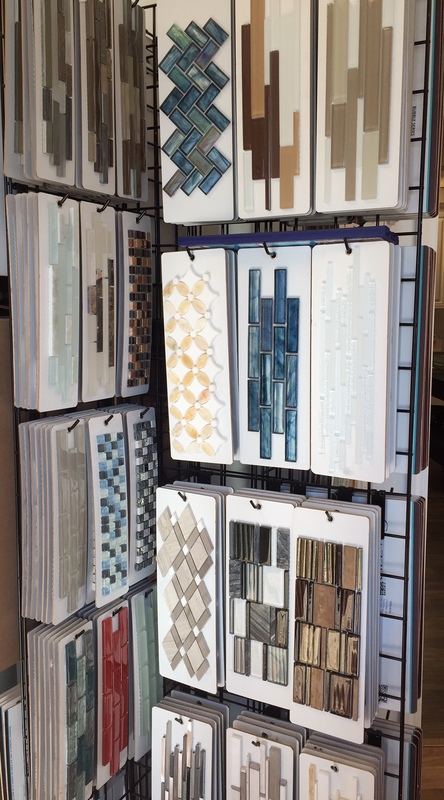 If you don’t find anything you like here, we are dealers of Clayton Tile and can stop by their showroom to pick out anything they have available! Have I overwhelmed you yet? I didn’t think so! There are so many unique and beautiful ways to make your bath more contemporary (my favorite design aesthetic!) 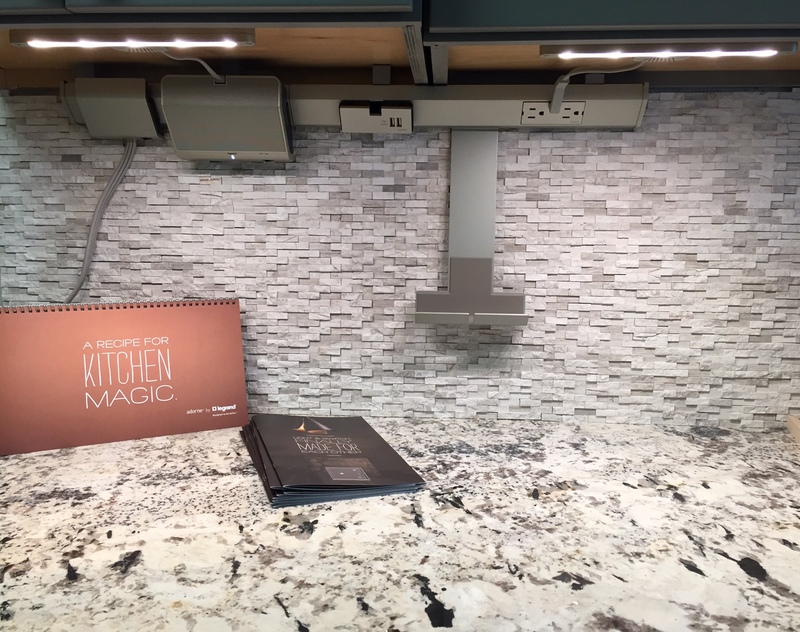 You can also use these same ideals in your kitchen with flat panel/slab door styles, quartz countertops, a sleek backsplash, a commercial faucet like the one below and our new state-of-the-art under cabinet lighting system which is a track that holds your outlets as well! 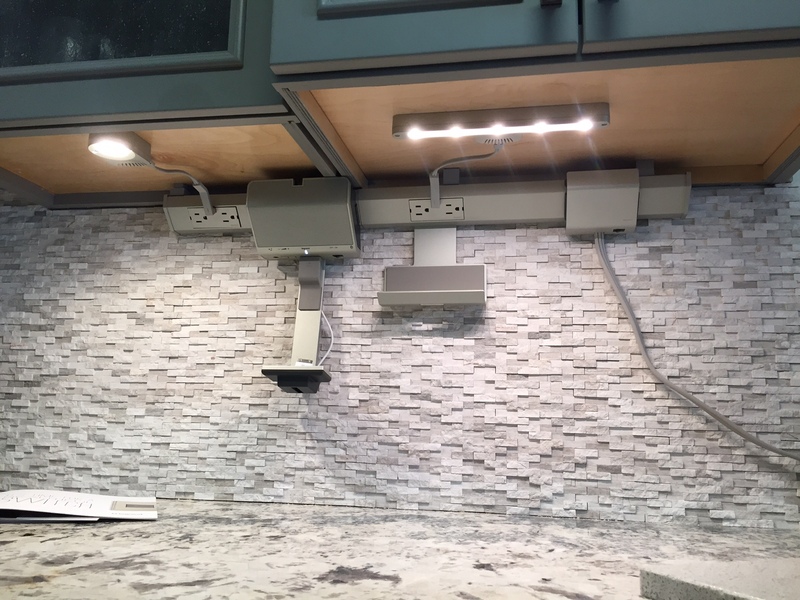 No more ugly outlets crowding up your backsplash! Take a look at the pictures below where I will include more information! 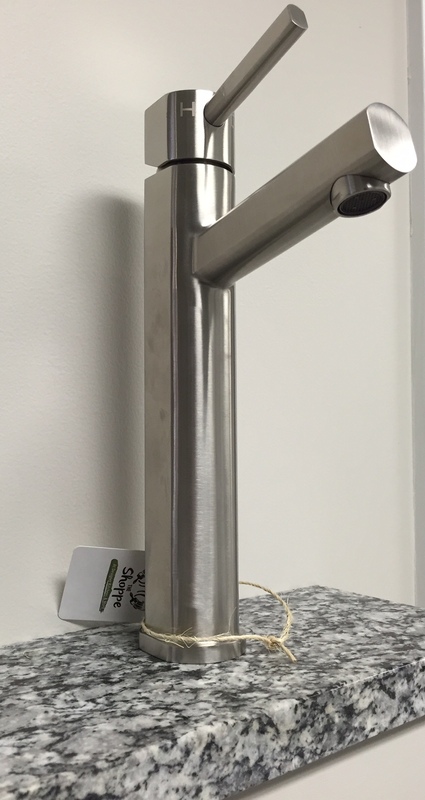 Commercial looking faucet for a contemporary kitchen! This system has got to be my favorite new innovation of this year! It is an under cabinet lighting system which is on a track. The track also holds your outlets as well! 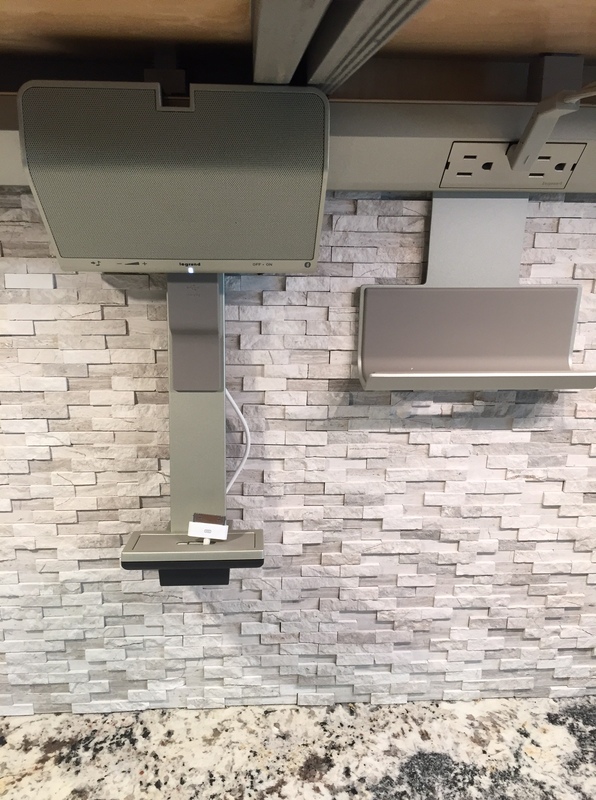 This system really cleans up the look of your backsplash and has some AMAZING features and accessories. Your outlets and lights are movable! Want more lighting in one area compared to another? You can do that! Want a USB outlet to charge your devices instead of a normal outlet? You can do that too! It also has some awesome accessories such as a Bluetooth capable speaker system, tablet and phone cradles, docking stations and more! You could even incorporate this system into a closet system or Check out their website for more information or come into our showroom and take a look! Phew! That was a lot of information! As you can see there are a ton of ways to incorporate the 2015 trends and innovations! I cant wait to see what is in store for design in 2016! Next Post Let’s Get Organized!